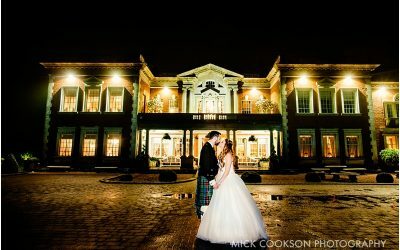 Keely & Craig were married recently at Beeston Manor – one of the busiest and most sought-after wedding venues in Lancashire. The couple booked me for their Beeston Manor Wedding Photography from a previous wedding fair at the venue, hosted by Little White Books. Here are the highlights from the day….from ridiculous flash flood showers to almost cloudless skies, seemingly every hour! Beeston Manor is set in the heart of the Lancashire countryside, situated between Preston and Blackburn. Housed in a restored 16th-century sandstone barn, this family-run guesthouse on 140 acres is 3.1 miles from the M6 motorway . With rustic-elegant rooms featured oak beams, pink sandstone walls, oak furniture and high-end en suite bathrooms, Beeston Manor is one of the most popular wedding venues in Lancashire. Expertly run by Janet, John and the ‘human dynamo’ that is Amy, Beeston Manor offers everything you’d need for your perfect Lancashire Wedding Photography…even a helicopter! Beeston Manor has a lovely rural feel about it, and is both a very unique venue – plus it’s also an exclusive one too. A Beeston Manor Wedding is always great to photograph. 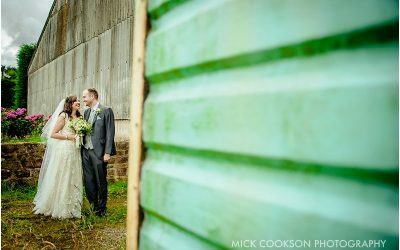 From the stunning ceremony room, through to the landscaped gardens, and the brilliant natural array of farm buildings around the venue, it’s a wedding photographer’s dream. Mix that with a bit of Lancashire sunshine, and voila! I met Keely and the girls having their hair and makeup done upstairs at Beeston Manor. In full high spirits, things were going well. Apart from the torrential rain showers. Hmmm…wonder if we’d beat them today? The ceremony room at Beeston Manor was set up nice and early, allowing me to grab a few images like these. The peace was soon to be broken though (in a nice way!) once the guests arrived and we were a few minutes away from the ceremony. Keely and Craig were fairly local to Beeston Manor, so it was perfect for them and their families too. As the ceremony time approached, Keely was putting on her wedding dress and making those final touches, ably aided by her bridesmaids. Craig, however was greeting the guests in the bar…but not drinking alcohol I hasten to add! As the guests took their seats, it was time for the wedding party to appear. Bridesmaids and flowergirls first…then that all-important gap befor Keely and her dady walked down the aisle to that almost inaudible rush of gasps and delight. Craig suddenly changed from the slightly anxious groom, to a very excited, proud man as he saw his bride walking towards him. With the weather now firmly on our side, Keely, Craig and I ventured out for a few more wedding photos after the wedding breakfast and speeches. We had a good fifteen minutes or so to grab some very natural and relaxed Bride & Groom portraits, so we made use of the time. This was more like it! Natural moments, captured in a natural style with no forced direction from me.